Make these attractive Planters entirely from boards salvaged from free shipping pallets! Using wood from recycled pallets just makes sense...not only do you save money making these useful Planters but you also help the environment by saving trees and keeping used pallets out of landfills. 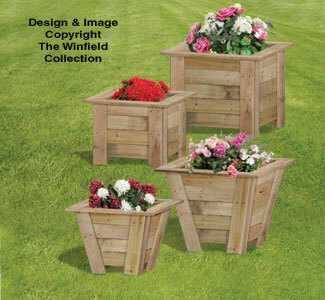 Make both of these rustic designs in two sizes to display potted flowers and plants. The larger size accepts up to a 16" pot while the medium size up to a 12" pot. Can be left natural or painted.